Meier, Allison. 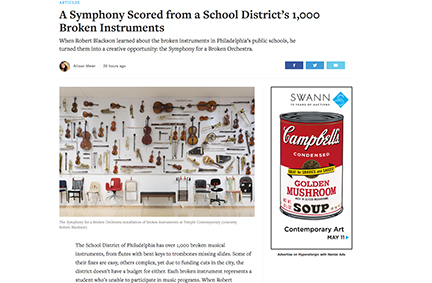 "A Symphony Scored from a School District's 1,000 Broken Instruments." Hyperallergic. 5 May 2017. Click here to read more. Sellers, Meredith. "Learning to Read Objects Like Letters." Hyperallergic. 21 January 2016. Click here to read more. Hudle, Jon. 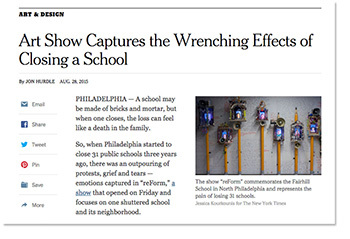 "Art Show Captures the Wrenching Effects of Closing a School." The New York Times. 28 August 2015. Click here to read more. Urist, Jacoba. "Reimagining Abandoned Schools: Can Art Depicting Empty Classrooms Shape Education Policy?" The Atlantic. 2 December 2015. Click here to read more. Patch, Lianna. "Friday Funday at Fairhill." The Art Blog. 30 April 2015. Click here to read more. Crimmins, Peter. "In Nod to History, A Crumbling Philly Row House Gets a Funeral." All Things Considered. NPR. 30 May 2014. Click here to read more. "Funeral to be Held for Philadelphia House." Here and Now. WBUR Boston. 29 May 2014. Click here to read more. Blumgart, Jake. "With Vacant Land in the News, Funeral for a Home Takes a Nuanced Look at the Demolition Epidemic." Flyingkitemedia.com. 19 November 2013. Click here to read more. Smith, Sandy. "Death of a Rowhome." Phillymag.com. 13 May 2014. "Photos: Funeral for a home in Philadelphia." Al Jazeera America. 1 June, 2014. Click here to see more. "History in the Making." Grid Magazine. 7 May 2015. Click here to read more. Rochester, Katherine. "Polly Apfelbaum and Dan Cole." ArtForum. 2014. Click here to read more. Click here to read articles about some Temple Contemporary events from theartblog. Hoffman, Hillel. 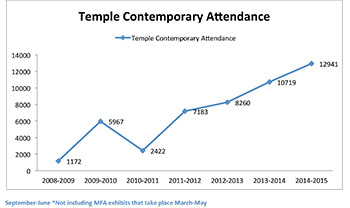 "Temple Contemporary's Leading Light." Temple News. 25 September 2012. Click here to read more. Pastan, Rachel. "Wild Imaginings: ICA @ 50." Miranda, Institute of Contemporary Art. 3 August 2012. Click here to read more. Macallister, Bonnie. "Temple Gallery Gets Contemporary, From Whirr to Wurlitzer to Buzz." Flying Kite. 23 October 2012. Click here to read more. Currall, Steve. "Temple Contemporary Offering Expanded Gallery & Events." Hidden City Philadelphie. 23 October 2012. Click here to read more. Monnier, Annette. "The rebranded Temple Contemporary probes the social function of art - and might even know what happy people smell like." City Paper. January 10, 2013. Click here to read more. Burton, Jzmyn. "Tyler students help restore a fading relic." The Temple News. March 7, 2013. Click here to read more. Kicey, Laura. "Philly Ghost Signs Being Repainted." PhillyMag. May 14, 2013. Click here to read more. Matheson, Kathy. "Painters brush new life into Philadelphia 'ghost signs'." Post-gazette. May 13, 2013. Click here to read more. Amado, Miguel. "Yevgeniy Fiks." Artforum. 18 October 2010. Click here to read more. Crimmins, Peter. "Communist Tour of the Philadelphia Museum of Art." WHYY. 18 October 2010. Newhall, Edith. "'Communist Conspiracy' gets the space it deserves." Philadelphia Inquirer. 26 September 2010. Booker, Bobbi. "Philagrafika celebrates diversity, collaboration." Philadelphia Tribune. 14 January 2010. Currier, Emily. "Fine Print: Carl Pope at Crane Arts Building and other locations." Critical Mass. 18 March 2010. Emmons, Amze. “Philagrafika 2010: Temple Gallery.” Printeresting. 30 January 2010. Click here to read more. Fallon, Roberta. “Fall Arts Preview.” theartblog.org. 15 September 2010. Click here to read more. Fallon, Roberta. “The News at Temple Gallery.” theartblog.org. 21 February 2010. Click here to read more. Gaia. “Philagrafika at Temple University.” Juxtapoz Art & Culture Magazine. 31 March 2010. Hirsch, Faye. "The Open Print." Art in America. 14 April 2010. Pages 67 – 74. Johnson, Ken. "What Is Printmaking Today? Philadelphia Dares to Ask." The New York Times. 4 February 2010. Click here to read more. and Click here to see images. Miles, David. “The $150,000 Question.” ARTINFO. 8 October 2009. Click here to read more. Nichols, Larry. "Gay Spaniard’s newsworthy art." Philadelphia Gay News. 19 February 2010. Click here to read more. Otterbein, Holly. “Last Chance Catch it or regret it.” Philadelphia City Paper. 23 March 2010. Perez-Luna, Elizabeth. “'Philagrafika' Printmaking: No Paper? No Problem.” All Things Considered, NPR. 6 April 2010. Click here to read more. Ripley, Deborah. “PAPER CHASE.” Artnet.com. 8 February 2010. Click here to read more. Sozanski, Ed. ""Art: Graphic Breadth and Depth" The Philadelphia Inquirer. 31 January 2010. Urban, Jason. “Philagrafika 2010: Temple Gallery.” Printeresting. 4 April 2010. Click here to read more. Warner, Emily. "The Graphic Unconscious" The Brooklyn Rail. 1 March 2010. West, Julia. “Fine Print: Thomas Kilpper at the Temple Gallery.” Philadelphia City Paper. 10 February 2010. Click here to read more. Crimmins, Peter. "Temple University students are bringing the Ben Franklin Bridge indoors." Arts and Culture Desk, WHYY. Philadelphia, 3 February 2009. Click here to listen. Crimmins, Peter, "Treasures of North Philadelphia." Arts and Culture Desk, WHYY. Philadelphia, 23 April 2009. Crimmins, Peter. "Under the Bridge." Philadelphia Weekly. 4 February 2009. Click here to read more. Ewing, John. "Field Reports: Documents and Strategies from Land Arts of the American West." Art Lies. Issue No. 61, Spring 2009: 98-99. Click here to read more. Fallon, Roberta. "Temple Gallery opens amid hoopla and discussion of horses (Trojan)." theartblog.org. 20 March 2009. Click here to read more. Fallon, Roberta. "Weekly Update - Spring for grand openings everywhere." theartblog.org. 24 March 2009. Click here to read more. Feighner, Jan. "By the Book." Art Matters. August 2008: 18-19, 28. Hill, Lori. "First Friday Focus." Philadelphia City Paper. 5-12 June 2008: 28. Kirsch, Andrea. "Make Room for Books." theartblog.org. 25 September 2008. Click here to read more. Russ, Valerie. "North Philly arts scene gets boost from Tyler School of Art." Philadelphia Daily News. 13 April 2009. Petersen, Stephen. "Volume Attempts: The Space of Books." Art on Paper. Vol. 13, No. 1, September/October 2008: 90-91. Scavuzzo, Sam. "Do this!" Philadelphia Inquirer. 24 April 2009. Schmidt, Alex. "New Temple art gallery opens." Arts and Culture Desk, WHYY. Philadelphia, 19 March 2009. Click here to read more.